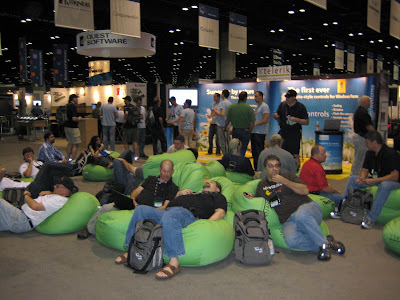 A busy week at TechEd is now over and in its wake are some sore feet and a great showing of Telerik's latest products. I had hoped to blog more often during the event, bringing you frequent updates from the floor. Unfortunately, or perhaps fortunately, things were so busy during the week (with demos in the day and TechEd parties at night) the updates did not make it online. Nonetheless, there is still some great information to share and I will be blogging "double time" when I get back to the office (where I'll be very happy to sit after a long week of standing). 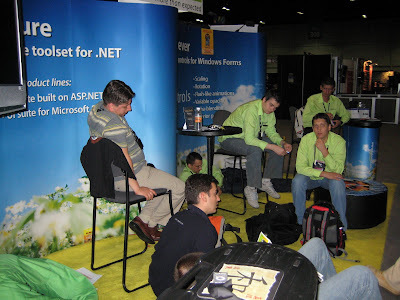 To get things started, I've uploaded some more pictures of Telerik at TechEd 2007. There are a couple of pictures in this post and about 20 more in this online gallery. You can see we had a great time visiting with all of the TechEd attendees- some our fans, some new to Telerik- and we look forward to seeing even more of you next year. You can also see our very popular t-shirts (the blue "geeket" T for girls and the black ".NET Superstar" shirt for everyone) and Telerik green bean bags. The "stars" of Telerik's TechEd presentations this year, though, were RadControls for WinForms and the sneak preview of RadScheduler for ASP.NET. Many people that stopped by our booth were amazed at the stunning WPF-like visuals that the Telerik controls for WinForms are delivering. In fact, even some Microsoft employees were in disbelief that the RadControls for WinForms were not using WPF to deliver their next generation visuals. Needless to say, if you haven't checked out the WinForms stuff from Telerik lately, you should! The RadScheduler sneak preview was also popular. The control is still early in its development cycle, but a public "beta" (it will actually be more like a CTP) should be available online in a few weeks. I will provide more details on the upcoming control along with some pics in a future post. And that's all from Telerik TechEd 2007 (for now)! Stay tuned for more updates in the coming days and start making your plans to come visit us next year, June 9-13th in Orlando again.